Pita pizzas are officially my new favorite meal. They’re delicious, versatile, and literally could not be easier or faster to make. These vegan roasted garlic pita pizzas are my new favorite way to enjoy my new favorite meal! How can you go wrong with roasted garlic, arugula, and figs? With a touch of balsamic glaze, the flavors taste like they were meant to go together. Paired with creamy vegan almond ricotta, these vegan roasted garlic pita pizzas are truly scrumptious- I hope you enjoy! This super simple pita pizza recipe was originally destined to be a part of my debut cookbook, 30 Minute Vegan Dinners, which is due out this February. Alas, figs did not come into season before my manuscript deadline, which is lucky for you all- you get this recipe four months early! If you try these vegan roasted garlic pita pizzas, be sure to rate them in the comments and let me know how they turned out! Dont forget to tag a photo on Instagram with #carrotsandflowers! I just love seeing all the remakes. It makes me SO happy. If you love roasted garlic, be sure to check out our mega-popular Vegan Roasted Garlic Alfredo! Foolproof vegan roasted garlic pizza with arugula and figs. 7 ingredients + BIG flavor make these pita pizzas perfect for a delicious weeknight meal. Preheat the oven to 450 F with a rack in the center. Place the pitas onto two baking sheets. Smash and spread 2-3 cloves of roasted garlic over each pita. Spread the almond ricotta over the roasted garlic. Divide the cheese among the pitas. Place the baking sheets on the center rack side by side. Bake the pizzas at 450 F for 7-8 minutes, until the crust begins to brown and the cheese is melty. Meanwhile, slice the figs. 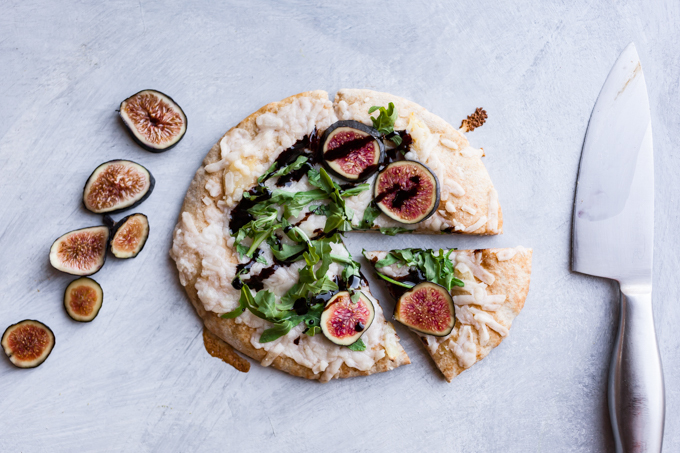 Top the pita pizzas with arugula, sliced figs, and a drizzle of balsamic glaze. Let stand for 1 minute before slicing and serving. Make ahead- Trim the tip of the garlic bulb so all of the cloves are exposed. Drizzle oil over the garlic cloves. Wrap with foil and roast for 35-45 minutes. Let cool enough to handle then squeeze the cloves from the head. I like to do this the night before with a pan of roasted veggies. What a beautiful pairing and presentation. You always inspire me. Thank you! Thank you so much for your lovely comment Bec! I’m so glad you enjoy my work!